One more guide which help me to save nerves. 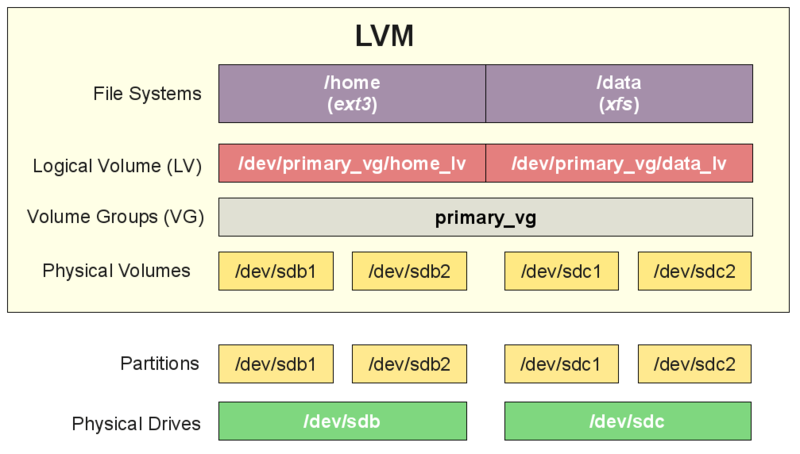 We use the pvcreate command which creates a physical volume for later use by the logical volume manager (LVM). In this case the physical volume will be our new /dev/sda3 partition. Next we need to confirm the name of the current volume group using the vgdisplay command. The name will vary depending on your setup, for me it is the name of my test server. vgdisplay provides lots of information on the volume group, I have only shown the name and the current size of it for this example. Now we extend the ‘Mega’ volume group by adding in the physical volume of /dev/sda3 which we created using the pvcreate command earlier. Next we need to increase the logical volume (rather than the physical volume) which basically means we will be taking our original logical volume and extending it over our new partition/physical volume of /dev/sda3. Firstly confirm the name of the logical volume using lvdisplay. This name will vary depending on your setup. The logical volume is then extended using the lvextend command. There is then one final step which is to resize the file system so that it can take advantage of this additional space, this is done using the resize2fs command for ext based file systems. Note that this may take some time to complete, it took about 30 seconds for my additional space. root@Mega:~# resize2fs /dev/Mega/root resize2fs 1.41.12 (17-May-2010) Filesystem at /dev/Mega/root is mounted on /; on-line resizing required old desc_blocks = 2, new_desc_blocks = 2 Performing an on-line resize of /dev/Mega/root to 7576576 (4k) blocks. The filesystem on /dev/Mega/root is now 7576576 blocks long. Performing an on-line resize of /dev/Mega/root to 7576576 (4k) blocks. The filesystem on /dev/Mega/root is now 7576576 blocks long. Alternatively if you’re running the XFS file system (default as of RedHat/CentOS 7) you can grow the file system with “xfs_growfs /dev/Mega/root”. That’s it, now with the ‘df’ command we can see that the total available disk space has been increased. Tagged /dev/sda, centos, disk, extend, lvm, volumes.